Yup, the city named was Las Vegas. I had to read the sentence twice to make sure I was reading what I was reading. I’m not sure why, but it does seem like a lot of media stories tell of people’s dislike for Vegas, one of my favorite places to visit. I kind of find it hard to believe that so many people hate my favorite town. Hey, last year a total of nearly 40 million people visited the city. And, according to those who keep track of such stats, almost the same number of people will travel to Vegas in 2013. Why would so many visit Vegas if they hate the city so much? Even when I don’t win anything during a visit to what they often call “Sin City,” I always enjoy myself when I’m there. Ditto with a lot of friends who are frequent visitors. I guess the story was published because a lot of journalists have written stories about the so-called “hate” expressed by a lot of media writers. Hey, maybe I’m one of the few media writers who write positive stories about Vegas. Even if I don’t walk away with a pocketful of money won in the casino, I can say I enjoy myself when I’m in Vegas, win or lose. And as people who read my blabbing know, I usually donate more to the Vegas economy than to the Yoshinaga household. Doesn’t sound like she hates Vegas, does it? A while back I wrote about Benihana restaurants and noted that the one in Torrance was closed. I was wrong. It’s still open and very popular with JA patrons. Janet Okubo alerted me to this fact with an email in which she wrote: “The Benihana in the Del Amo Center in Torrance is doing very well. I happened to go online at Benihana.com to place my birthday month reservation. They sent me on my birthday, which was in February, a certificate for $30 off my dinner. “I went with a friend on Wednesday, Feb. 27, believing it would not be busy. We arrived there at 6:30 p.m. and told there was a 1 ½ to 1 ¾ hour wait. Since we were not busy, we decided to wait. Many customers kept coming in and were told the same thing. “After waiting approximately one hour, we were seated. Thanks Janet. My birthday is in July, so maybe I’ll give it a try. Sure could use a $30 discount myself. We often wondered how native Japanese feel about “foreign Japanese” (I guess you can say Nisei and Sansei) living among them. Well, I ran across an article in The Japan Times (an all-English publication issued in Japan) that said a survey among the Japanese indicated that 80% of them were open to the idea of foreign nationals (mostly Japanese Brazilian and Japanese Peruvian immigrants) living alongside them, mostly those who don’t have Japanese citizenship. With more opportunities to interact with foreigners, the Japanese people no longer reject the idea of accepting non-Japanese nationals in their society. Only 12.9% said they are unwilling to accept foreigners of Japanese descent. Japanese Americans were not included in the survey because not many Nisei and Sansei are permanently living in Japan. The survey, which canvassed 3,000 Japanese adults in January 2013, said 59.7% of respondents were in favor of calls asking the central government and municipalities to assist non-Japanese residents by providing Japanese-language classes for unemployed young people and recruiting interpreters at Hello Work job-placement offices. As of the end of 2011, there were fewer than 300,000 foreigners of Japanese descent living in Japan. They included 210,000 Brazilians and 50,000 Peruvians, the Cabinet Office reported. Kind of an interesting stat, I thought. It might be an indication that those of Japanese descent living in Brazil and Peru are having a tough time and might find Japan a better place to reside. Well by the time you read this column, the election results will be in as Tuesday was when the polls were open. Among the interesting results will be the mayor’s race in the City of Gardena. 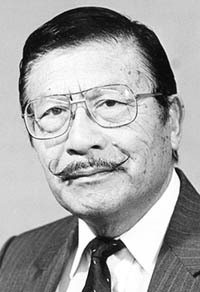 As we all know, presiding mayor Paul Tanaka is not seeking re-election, but his name will still be on the ballot. The only one actively campaigning for the mayor’s seat is City Councilwoman Rachel Johnson, who is black. In her final campaign flyer received by Gardena voters on Saturday, she has photographs of five public officials who are endorsing her in the election. They are State Sen. Rod Wright, Assemblyman Steve Bradford, Assemblyman Isadore Hall, L.A. County Supervisor Mark Ridley Thomas, and Metro Water District Vice Chair Gloria Gray. No need to point out any more. By the time you read this, you’ll all know who the next mayor will be and how effective Johnson’s campaign strategy was. Most people feel that even though Tanaka isn’t campaigning, he will still win. Yes, I cast my ballot for him. The City of Gardena is a lot better since he was elected mayor, and that’s more important than anything else. In the day and age of high technology, it’s a fact that almost everyone carries a cellphone. And at many public functions, such as memorial service for the deceased, a spokesman will remind those attending the service to turn off their cells before the start of the ritual. Well, this past Saturday I did attend a memorial and when the spokesman asked everyone to turn off their cell phone, I remembered that mine was on, so I quickly pulled it out of my carrying case and shut it off. The person sitting next to me probably forgot his was on because when the ritual was about halfway through, his phone rang. He quickly jumped up and left the hall. I guess it was about ten minutes later when he returned and sat down. I didn’t say anything to him because I can understand how it could happen. A few years ago the same thing happened to me. It made me think that perhaps those in charge of such an event should be asking someone at the entryway to remind people about turning off their cells instead of making an announcement from the stage. Those who knew me back in the late ’40s (1944-1948) won’t recognize me today. When I stepped on the scale in those days, the needle stopped at 240 pounds. Today I weigh about 170 pounds, which means I weighed 70 pounds more than I do now. No, I didn’t go on a diet. I stopped eating at fast-food places. You know about those eateries and what they serve. A study of overweight people showed that most of the “fatties” eat at fast-food places. The survey covered 11,000 adults between 2007 and 2011. It was conducted by the Center of Disease Control and Prevention. Fast foods include hamburgers, fries and milkshakes. The study found that obese people get about 13% of their daily calories from fast food compared to less than 10% for skinny and normal-weight people. Perhaps that’s why people in Japan are all normal or underweight. No I don’t know if sumo wrestlers eat at McDonald’s. Speaking about eating and weight, there is a campaign now to promote Japanese sake in places other than sushi bars. As one person put it, the thought of buying sake at supermarkets may seem as out of place as using chopsticks to eat Cheerios. But wait, a Los Angeles marketing and advertising agency will promote sake in places not associated with sushi bars. I guess it will be interesting to see how the campaign turns out. Will keep an eye on the outcome of this new campaign and if Americans will go for sake without sushi. That might be the conversation of two people meeting on the street in downtown Honolulu. That’s because a recent survey indicated that Hawaii is the most happy state in the U.S. The study was conducted by mathematicians at the University of Vermont. Finishing second behind Hawaii was Maine. Well, you have to go down to 13th place to find the Golden State. Who finished ahead of our state? Nevada, Utah, Vermont, Colorado, Idaho, New Hampshire, Washington, Wyoming, Minnesota, and Arizona. I’m not sure how those conducting the survey made the conclusion. Oh well, when I’m in Vegas I guess I do sense that people living there can contribute to Nevada’s quite high ranking. I do see more smiling faces there than I do in Los Angeles (or California).